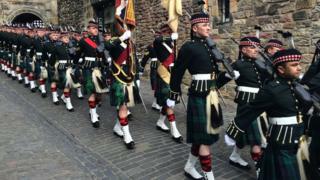 Soldiers who face paying more tax because they live in Scotland will continue to be compensated by the UK government. A divergence in rates means that income tax higher earners in Scotland pay more than they do in the rest of the UK. At PMQs Theresa May said about 7,000 military personnel in Scotland would receive compensation to ensure that all soldiers pay the same across the UK. Scotland's finance secretary said the MoD "failed to consult" on the issue. Derek Mackay added that armed forces families in Scotland have access to services and benefits not available elsewhere in the UK. The last Scottish government budget in December 2018 confirmed further divergence between Scottish and UK tax rates. As a result the financial compensation cap for armed forces personnel liable for Scottish tax has increased from £1,500 to £2,200. It will see personnel paid between £12 and £2,200 in a retrospective single payment, covering the 2019/20 tax year. And it is expected to cost the MoD £6m. Last year the Scottish government said it had offered to discuss the issue with the UK government but did not receive a reply. Finance Secretary Derek Mackay said: "As a result of the Scottish government's progressive tax system most Scottish income tax payers - including thousands of armed forces personnel - will pay less income tax than people earning the same and living in the rest of the UK. "We are fully committed to supporting the armed forces community. Scotland continues to be an attractive place to live, work and do business with armed forces families in Scotland able to access many services and benefits not available elsewhere in the UK.